About a year ago, Theophilos III, the Orthodox Patriarch of Jerusalem, warned in an op-ed in the Guardian that Israeli policies are driving Palestinian Christians out of the Holy Land. He outlined the efforts of the Israeli Knesset to strip Palestinian Christians of their church lands and property rights through a “church lands” bill that would put an end to the church’s sovereignty over its lands in the old city of Jerusalem. Theophilos III also pointed out the activities of radical settler groups in and around Jerusalem that are destabilising the status quo regarding “the protection and accessibility” of the holy sites in the city. Many of these radical settlers have been suspected of carrying out “price tag” attacks on churches and other Christian properties, desecrating and vandalising churches, monasteries, and holy sites and spraying hate graffiti on them. In most of these cases, the Israeli authorities did not apprehend any suspects and dismissed the incidents on the grounds of unknown perpetrators. These attacks on Christian churches and properties, which date back to the Nakba, also target Christians in the West Bank. Israeli forces, for example, have raided a well-known monastery in Bethlehem and attempted to confiscate its land to continue building its apartheid annexation and separation wall in the Cremisan Valley. It is important to note that Israeli military forces aid and abet the radical settlers in their desecration of Christian sites, offering them the protection they need as they raid these sites to perform religious rituals there. The state’s racist and discriminatory laws, closure policies and the apartheid annexation and separation wall restrict the access of Palestinian Christians to the holy sites in Jerusalem, effectively censuring their religious freedom and hindering them from practising their faith. These policies, as Theophilos III warns, threaten “the very presence of Christians in the Holy Land”. 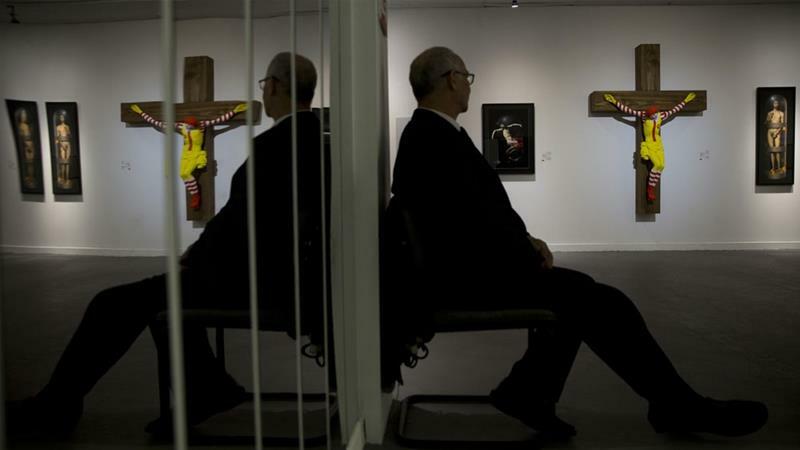 On how a Finnish artist’s irreverent artworks helped Israel conceal its ongoing oppression of Palestinian Christians. By Kathryn Shihadah, If Americans Knew – The New Testament records that Jesus Christ took two loaves of bread and five fish, and fed five thousand people. Ancient believers identified the place where they believe this miracle happened and built a church on the site. Today the Church of the Multiplication of the Loaves and Fishes stands in Israel, its 5th century mosaic floors still intact. Outside is a large rock where, legend has it, Jesus placed the bread before he distributed it to the crowd. Since the newest shrine was built in 1984, the site has attracted thousands of pilgrims every day—except for an eight-month period in 2015-16, when it was closed for renovation after two Israeli settlers, Yinon Reuveni and Yehuda Asraf, vandalized and set it on fire. On July 3rd, Reuveni was found guilty of arson. Many American Christians were surprised when the vandalism story broke, and figured it was a fluke. After all, Christians and Jews share a common history. Christians, like Jews, revere the Old Testament, so there is a certain implied kinship. And most Christians assume that Israel is a friend of Christianity. The attack must have been some random act by a rogue, probably deranged, Israeli. How else to explain an act of arson perpetrated against a sacred site like the Church of the Multiplication? As “shocked” and “saddened” as Israel’s heads of state claim to be, church vandalism by Jewish settlers in the Holy Land is actually all too common, and has been an issue for years. The 1980s saw a spate of church desecrations, including the burning down of the Baptist church in Jerusalem. Donald Neff, former Time Magazine Jerusalem bureau chief and author of five books on Israel-Palestine, reported on a number of Zionist attacks during the 1948 war, according to Alison Weir’s Against Our Better Judgment. He quoted one Catholic priest, “Jewish soldiers broke down the doors of my church and robbed many precious and sacred objects. Then they threw the statues of Christ down into a nearby garden.” Christian leaders described in detail attacks on Christian sites, killing and injuring hundreds, including children, clergy, and refugees—all in spite of the fact that Jewish leaders had promised to preserve religious buildings. For several decades, the attacks on religious sites quieted, then the 1980s saw a spate of church desecrations, including the burning down of the Baptist church in Jerusalem. In 2008 an Israeli mayor ordered that New Testaments in the town be gathered up, dumped them into a pile, then burned them. Christians (as well as Muslims) in Israel and Palestine have been subject to milder forms of state-sponsored persecution through discriminatory laws for decades. Since 1993 Israel has required Palestinians, in what the American Friends Service Committee describes as a “draconian system of movement controls [that] has become increasingly institutionalized and restrictive,” to obtain a military permit to visit their holy sites, including the Church of the Holy Sepulchre and the Noble Sanctuary mosque complex, in Jerusalem’s Old City. This permit is almost impossible to procure, and effectively restricts millions of Christians’ and Muslims’ freedom of movement and worship. This is in sharp contrast to crimes against Jews, in which Palestinians, both guilty and innocent, are regularly apprehended and imprisoned—with an almost 100% conviction rate—in a system of military law that affords them few rights. This ongoing injustice and oppression by a majority government and some of its people has compelled many indigenous Palestinian Christians to flee the land where their faith was born. In 1947, just before Israel was established, the Palestinian Christian community made up 7% of the population and numbered about 140,000—compared to roughly 630,000 Jews and 1.2 million Muslims. Today Christians comprise only 1-2.5% of the population of Israel/Palestine. The birthplace of Jesus Christ will soon have no Christian presence at all, thanks to a brutal occupation not unlike the one Jesus experienced. The lives of many of the Christians who remain in Israel and Palestine are dismal, a fate they share with their Muslim neighbors. Regarding the price tag attack at the Church of the Multiplication, they take little comfort in the guilty verdict, reserving any celebration until the sentence is handed down. Israeli courts have been notoriously lenient with Jewish convicts, more than once sentencing Jewish killers to community service. How do people of faith become so merciless? Radical interpretations of Jewish sacred writings, embraced by a small number of Israelis, bolster the most oppressive and discriminatory practices of Israel. Israeli author Israel Shahak explained that Jewish extremists “are not basing their religion on the ethics of justice. They do not accept the Old Testament as it is written. Rather, religious Jews turn to the Talmud. For them, the Talmudic Jewish laws become ‘the Bible.’ And the Talmud teaches that a Jew can kill a non-Jew with impunity.” Such extremists ignore other Talmudic statements that contradict this stance. Schneerson’s more familiar writings and teachings—on subjects like education and charity—have been published in English; some of his more controversial works are only available in the original Hebrew. However, authors Israel Shahak and Norton Mezvinsky have translated some of his more troubling teachings in their book Jewish Fundamentalism in Israel (text available here) in an effort to expose the danger of extremism in Jewish faith—much like the extremism seen among practitioners of other faiths. The following sample of Schneerson quotes are translations of messages published in Israel in 1965. To repeat: this is not mainstream Judaism. These are the views of the most extreme religious leaders and zealots, but have influenced individuals with a supremacist paradigm, including the Price Tag perpetrators. Such ideologies can be seen on the fringes of all faith groups, and are consistently refuted by moderates of their communities. When Price Tag first appeared in the 1980s, news of the attacks was not widely broadcast. Today, the internet brings these stories out in the open. The narrative of the victims has gained a hearing, and it is not attractive to the host state. (See this article and this video.) Israel is nervous—and is fighting back. Israel’s Ministry of Strategic Affairs and Public Diplomacy has created a website and smartphone app which are being used by “hundreds of thousands” of Israel supporters to comb through social media. They use their keyboards to “influence the conversation,” “stop the hate,” and “end the lies.” In reality, their assignment is to whitewash: to defend the reputation of Israel by neutralizing factual but negative press and repudiate unsavory but accurate news. All of this may come as a surprise to American Christians. But after the initial shock, pro-Israel Christians are often quick to explain away or condone whatever Israel does as somehow part of “God’s plan,” instead of allowing their paradigm to be influenced by truth. Should American Christians care about the facts? Should they be influenced by what Holy Land Christians have to say about the policies and practices of Israel? It makes sense to seek out the views of the indigenous people who know firsthand what is happening. According to a Pew Research study, 86% of Israeli Christians strongly believe that the US is too supportive of Israel. Only a small percentage of American Christians—18%–believe that the US is too supportive of Israel. The Christians of the Holy Land are experts on the subject. They need to drive the Christian conversation about Israel. Christians in America have a moral obligation to differentiate between fact and ideology, to be compassionate, and to join the struggle for justice.